Indigestion. Computer graphic of the torso of a clothed male figure, with both hands gripping his abdomen. The affected area is coloured red and has yellow lightning bolts depicting pain. Indigestion (dyspepsia) is a general term for pain associated with eating, including heartburn, abdominal pain, nausea and flatulence. 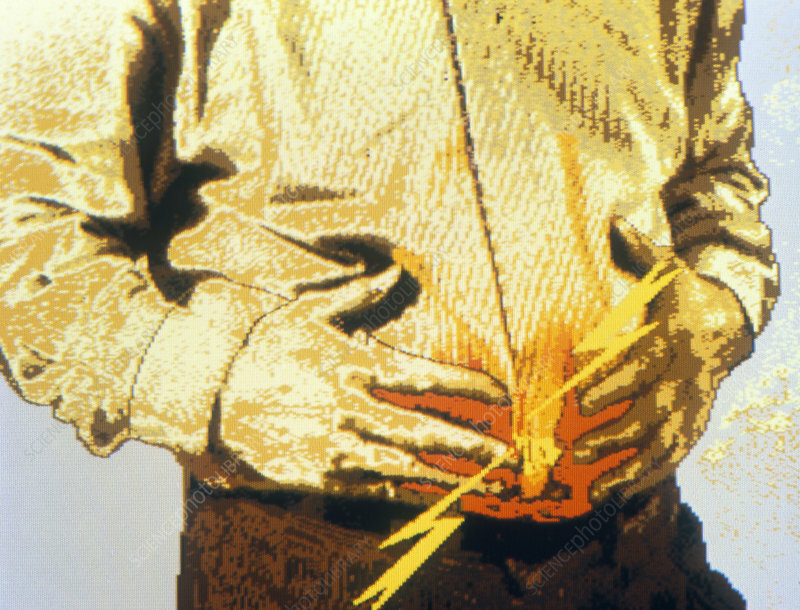 Typically, indigestion is associated with discomfort or a burning pain in the stomach area or behind the sternum. The sensation may rise from the abdomen into the throat and be accompanied by the regurgitation of acidic stomach contents into the mouth. Indigestion occurs after eating too much, too quickly, or by eating rich, spicy, or fatty foods.